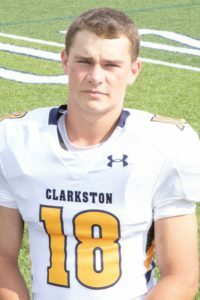 Clarkston High School senior Josh Luther was selected for the 2018 Football Academic All-State Dream Team. Athletes are chosen for the dream team by the Michigan High School Football Coaches Association. It is an elite group of 28 scholar athletes nominated by their head coach and picked based upon grade point average and ACT/SAT score. Luther finished his football season at the MHSAA Division 1 Football State Championship. He played on both ends of the field in the loss against Chippewa Valley. He rushed the ball once for 11 yards and received four passes for 51 yards. He also had four kickoff returns. On the defensive end, he led with five tackles and had one assist. During the 21-3 semifinal win over Saline, Luther caught a 15-yard touchdown pass and caught a total of five passes for 40 yards. He had three tackles and one assist. Luther recently finished his final winter season with the Clarkston Boys Varsity Basketball team. Join Luther and the Wolves this spring for the Clarkston Varsity Baseball season. They posted their first win in their season opener against Everest on March 28, 9-4. They return from spring break heading to Davison on Tuesday. Luther and the team are back home in double headers against Bloomfield Hills, April 10, and Walled Lake Northern, April 11.